Lake Charles CITGO donates $3,000 in sponsorship of the 2017 International Club of SWLA Annual Gala held Dec. 2 at Isle of Capri Casino Resort. 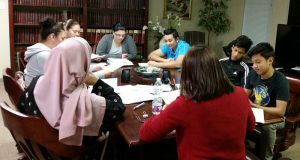 Thanks to CITGO’s continuous help throughout the years, the International Club of SWLA is growing stronger and is able to help more newcomers. On hand for the donation are, from left, Dalia Matheus, Officer of International Club of SWLA; Dana Keel, Government and Public Affairs Manager of CITGO; Donnie Glyenn, President of International Club of SWLA. ESL classes and Spanish classes coming soon. 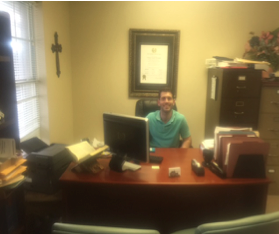 Through the Louisiana Bar Foundation grant of $50,000 we were able to hire a staff attorney, Chance Shoemake, to fit the growing needs of the community. Chance began as a volunteer with the organization. A native of the Lake Charles area, Chance attended law school in San Antonio, where he went on to pass the Texas Bar. He is now studying for the Louisiana Bar. We are grateful to the Louisiana Bar Foundation for this generous grant to assist our community. 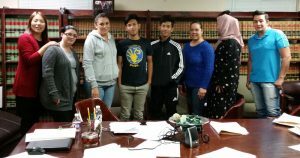 Chance assists people in the following areas: adjustments of status, work permits, attaining citizenship, refugees, domestic violence, and reuniting immigrant families. Congratulations to Mr. and Mrs. Guidry on their recent wedding ceremony. St. Frances Cabrini Immigration Law Center was instrumental in uniting Mr. and Mrs. Guidry through a fiancé Visa. 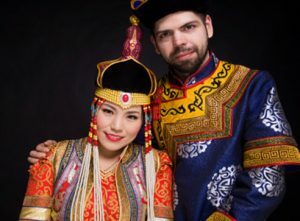 In the picture, they wear traditional Mongolian wedding dress. It’s made of cotton and silk with handmade decorations. Usually the bride is in red and gold while the groom wears blue and gray. The wedding lasts at least two days. All family members come to join in the celebration of love. They bring instruments to play and sing while enjoying a big meal — mostly mutton and beef. Of course, alcohol accompanies the festivities. They have kept this tradition for hundreds of years since the time their hero, Genghis Khan, attempted to conquer Europe. Congratulations to Mr. and Mrs. Guidry! We would like to thank Mayor Randy Roach and his staff for the continued support of our organization. 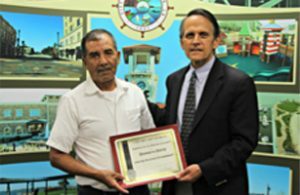 He personally recognized and congratulated Mr. Dionizio Ortiz for obtaining his citizenship after 29 years in the United States.